When it comes to buying tires, there’s a lot to consider. But don’t worry, we take the time to talk to you about your vehicle, your current tires, and your driving habits so we can identify the very best tires for you. 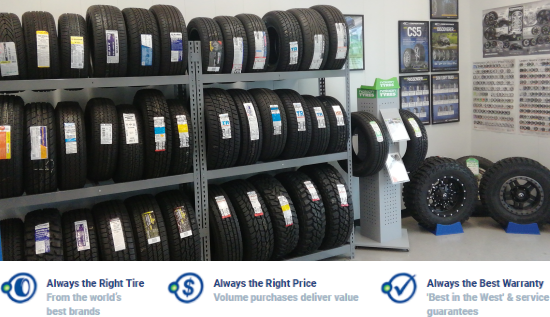 At Carpenter Point S Tire & Auto Service, our primary goals are always to get you into The Right Tire at The Right Price and to stand by you through the life of the tire with our Best-in-the-West Tire Warranty. As the only independent, full-service tire and auto shop in Brookings, our commitment is to the community. We never base tire recommendations on corporate decisions made somewhere across the state or the country. All our focus is on serving you, our neighbor. That means you can count on us to suggest the very best tire options for your particular vehicle, lifestyle, and budget. Every time. We are proud to partner with over 3,400 independently owned Point S stores located across the Western United States and in 32 countries around the world. This partnership enables us to provide you with an unmatched selection of name-brand tires and wheels, always priced to deliver value to you, our customer and our neighbor. What's more, our Best-in-the-West Tire Warranty is honored at every Point S store, giving you access to free warranty services and caring customer support in Brookings and wherever the road take you. Stop in or call for tire recommendations and pricing today.